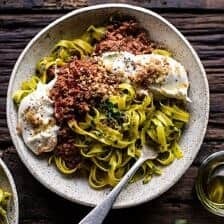 With the red sauce, green pasta and white burrata cheese?? I know, I know, could I be anymore childish. Probably not, but December is the one month out of the year that you can really see the child in me. Anyway, let me just tell you about this pasta. It’s hands down one of my favorite cozy, wintery pasta recipes. It’s easy to make, pleasing to the eye and totally delicious. Obviously. I don’t typically make Bolognese sauce unless I’m making this Classic Lasagna (which you should all make, and probably this month because it’s the PERFECT holiday recipe). Personally, I’m really only into ground beef recipes that are loaded with flavors (think Thai Beef and enchilada’s)…or cheese. Duh. Usually I prefer to go with chorizo, I just love its more intense flavor. Therefore, a chorizo Bolognese just seemed like the way to go. I know it’s a little different, but I promise guys, this sauce is SO flavorful. 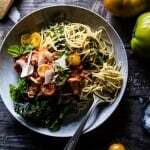 Think Spanish meets Italian… it’s delish. For the pasta, I simply tossed it with a sage kale pesto mix. Although I’m not sure you can really call it a pesto since there are no nuts, whatever you want to call it, this mix adds great flavor and color. Alrighty, can we talk about the toppings though? The toppings are possibly my favorite. 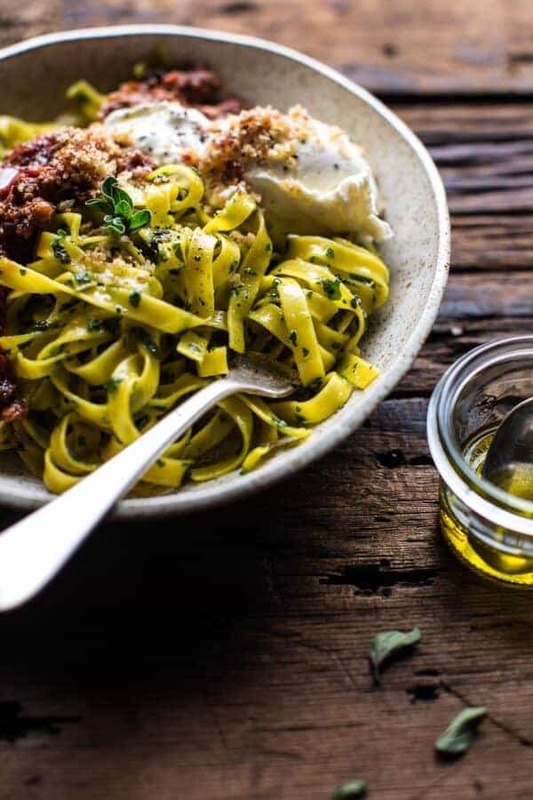 Buttered breadcrumbs with crispy prosciutto and burrata? Yes, count me in on that. 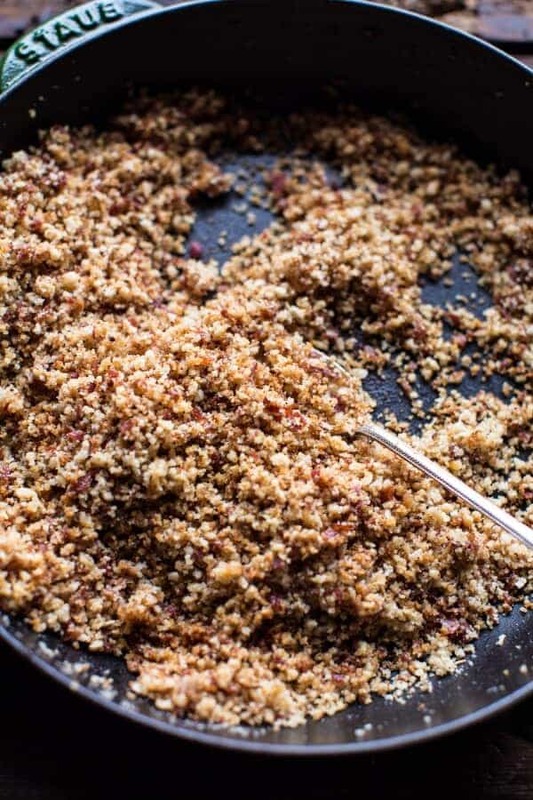 Pangrattato is really just a fancy name for breadcrumbs, but I’m really into them. Don’t let the fancy name fool you, pangrattato is simple to make AND gives this pasta the perfect finishing touch. And then well, the burrata…don’t think that really needs an explanation, I mean it’s delicious creamy cheese! So don’t you think this bowl just kind of screams MONDAY FOOD?? I honestly can’t think of anything better to eat right now, but then again, it is super cold and snowy here, and I really just want a big bowl of this and then off to my cozy bed to watch a Christmas movie. <–truth. 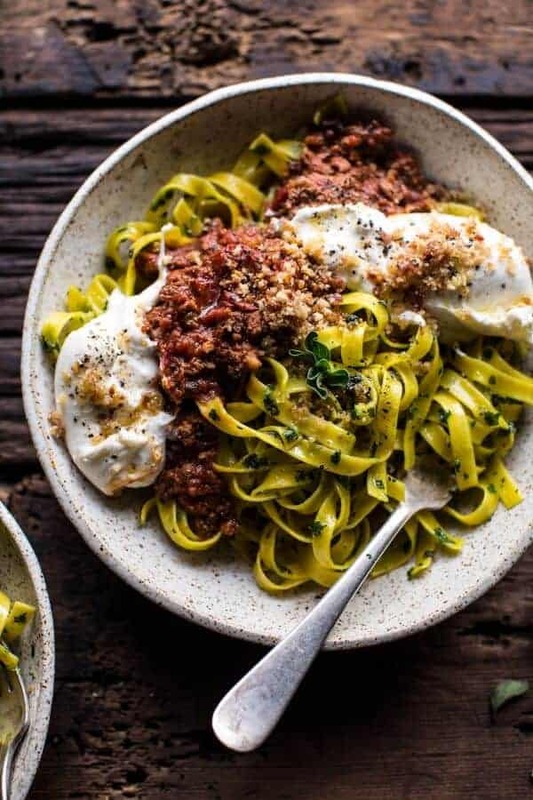 Moving on… I tried to make this chorizo Bolognese pasta as a quicker recipe, since time seems to NOT be on my side this month. That said, this is a great recipe to start in the morning before work and then come home to at night. 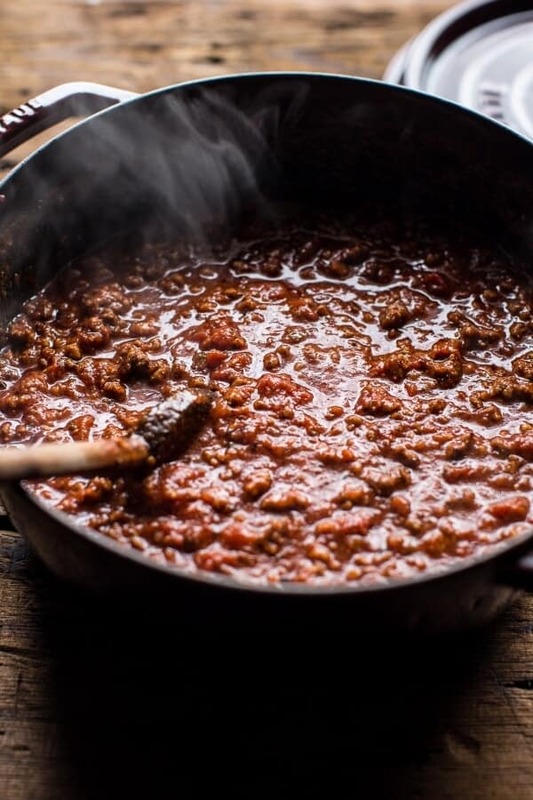 The longer the Bolognese can cook low and slow, the more flavor it will have. In fact, it’s even better the next day. The pangrattato will keep at room temperature for at least a few days in a sealed container, so be prepared for super yummy leftovers. YES. And finally, I want to put it out there that this is also a great meal to make for holiday guests. You can easily double or even triple the recipe to serve your crowd (or maybe just family), it’s best made ahead and it’s beautiful when plated. Okay and it’s kind of a crowd pleaser. Pretty sure I will be making this Saturday when all 12 of the family members get here for Christmas…whoa. How is it already time for family to come?!? Only ten full days till Christmas! I’m thinking that Santa would be into this Bolognese?? Thinking definitely. It's hands down one of my favorite cozy, wintery pasta recipes. It's easy to make, pleasing to the eye and totally delicious. Obviously. Heat a large dutch oven over medium heat. Add the olive oil and once hot, add the chorizo and brown all over, breaking up the meat as it cooks. Toss in the garlic and continue cookies for another minute. Stir in the tomatoes, whole milk, red wine, sun-dried tomato pesto, basil, oregano, crushed red pepper flakes and a pinch of salt + pepper to taste. Simmer the sauce over medium low heat for 20-30 minutes or until it has slightly reduced. If you have time, I recommend making the sauce in the morning and allowing it to simmer, covered, all day long. The longer the sauce cooks, the more flavor it will have. Meanwhile, make the pangrattato. 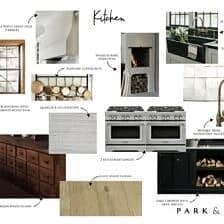 Preheat the oven to 350 degrees F. Line a baking sheet with parchment paper. Place the prosciutto slices on baking sheet and bake for 10-15 minutes or until crisp. Remove and allow to cool, then add to a food processor along with pistachios and toasted sourdough bread, process until fine crumbs. Add the butter to a large skillet or brasier with high sides. Allow the butter to brown lightly until it smells toasted, about 2 minutes. Now add the bread crumb mixture. Toast the mixture for about 5 minutes or until the bread crumbs are golden. If the bread crumbs seem as though they need more butter, add another 2 tablespoons. Season with salt and pepper. Remove the pangrattato from the skillet and set aside until ready to serve. Bring a large pot of salted water to a boil. Boil the pasta until al dente. Scoop out 1 cup of the pasta cooking water and then drain. 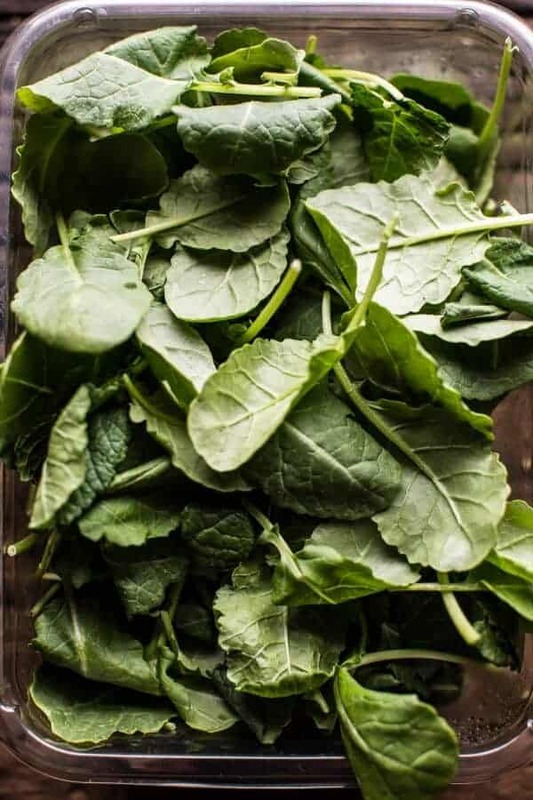 Return the pasta to the hot pot and toss with the sage/kale pesto mixture and as much of of the pasta cooking water as needed to create a sauce. 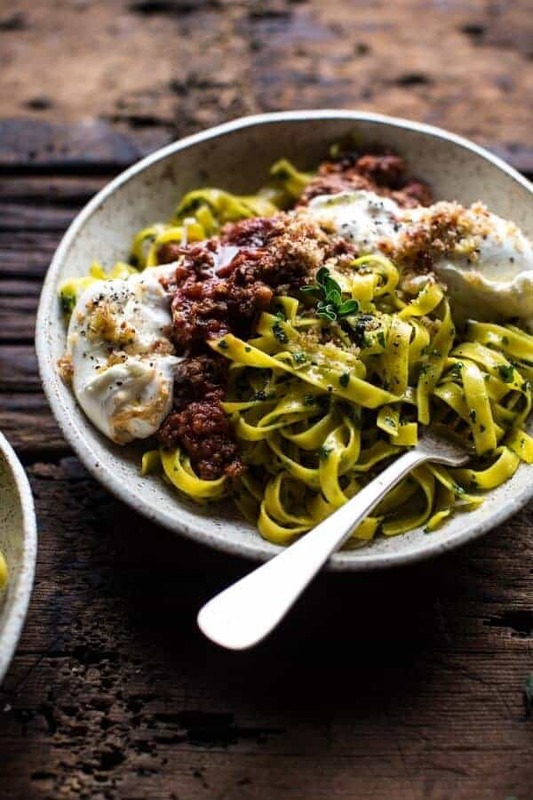 *Chorizo Bolognese inspired by Donna Hay Magazine. 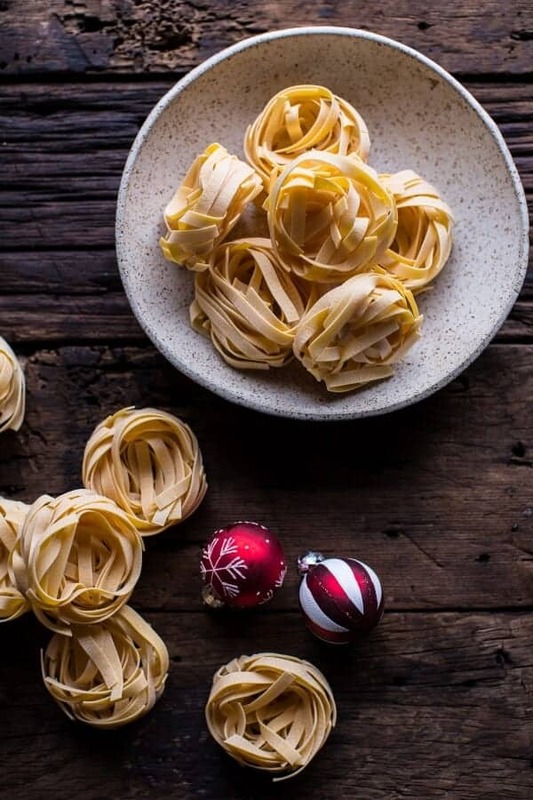 Pasta for all and to all a goodnight. 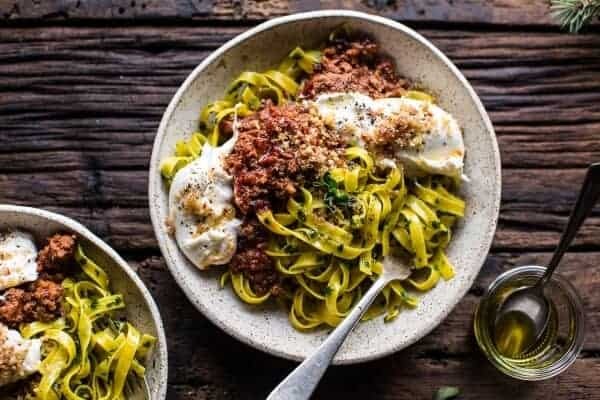 adding pesto to the bolognese is such a good idea; it has so much flavor, why not add it? and so glad there’s a kale non-pesto involved; i’m definitely not getting enough veggies these days. I gotta ask! What do you mean by non dried chorizo? Portugal is one of the world’s biggest chouriço (portuguese for chorizo) producers, but all our chorizos are of the dried kind, or smoked in some cases, mostly they are left hanging so the can cure and dry, so I don’t know what is a non dried chorizo and would looooove to try one – unless it’s what the french call sausichon? Man, I’m really confused now. you have to show me one non dried chorizo please!!! I love bolognese of any sort, I loooove pasta of any sort! Hi!! So in the US we have fresh ground chorizo which is a mix of ground pork and spices. If you can’t find it, use spicy Italian Sausage. Hope that helps you! Sorry- another chorizo question. Are you using Portuguese chorizo, Mexican, Spanish??? Hey Lisa! I used Mexican. Please let me know if you have any other questions. Hope you love this! Thanks! 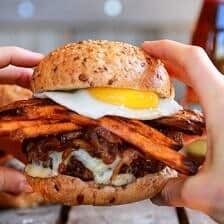 This recipe looks like something right out of Harry Potter. My wife and I always joke that we wish we could just have meals show up like at Hogwarts. Apparently no one wants to cook here. This looks fab as always! You’ve done it again! I just drool over your photos of food… they are that amazing and the food is just to die for! This is a 1 hour meal… and it looks that good??? SIGN ME UP!!!! Thanks Taylor! Hope you had a great Monday! This looks amazing Tieghan and I love that it’s red and green! These flavors sound fantastic together! When you said red, white and green and you were talking about Bolognese sauce I thought you were honoring my country, Italy 🙂 And then you tease the tastebuds with pangrattato,, prosciutto and pistachios. You can see why I’d get the impression. So we can be both childish and keep it at an Italian Christmas. Great recipe. 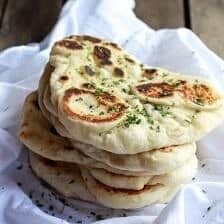 Grazie per la ricetta. Buona giornata. Loving the holiday colors in this dish! Sneaky! And I’m drooling over the entire meal, I don’t think we would have ANY leftovers to enjoy if I made that here. And the pictures are beautiful of course. Yum! But tell me about chorizo and dried chorizo… Not sure of the difference..I see someone else had a question too!can’t wait to hear back … Will check what the chorizo in ny supermarket says! Dried chorizo is a much more intense flavor and you will not need to use as much. Fresh ground chorizo looks similar to ground sausage. Hope that helps and let me know if you have any other questions! 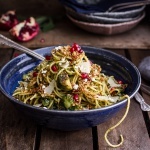 Love pasta dishes—-and this one has so many goodies in it. What a great combo of ingredients!! It looks amazing!! Your blog is my favorite to the point it’s not even a competition anymore. You nail it every time. 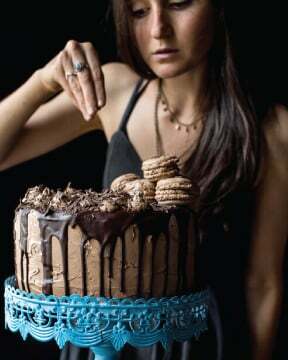 I’m making this ASAP!! Oooh this looks and sounds so delicious! This looks incredibly delicious! Can’t wait to try it! This looks amazing!! 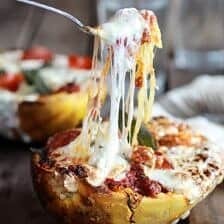 I think I’ve found what I’m making for Christmas Eve dinner! I NEED to cook this for the family! Being Italian, pasta is a regular dinner. This is taking pasta to a whole new level! Thanks so much! Hope you had a great Monday! Anything with burrata on it is recipe gold in my book! It so is the best! Thanks! I need to move next door to you! This dish looks so savory and delicious Tieghan! Yum! I love everything about this dish. Honestly, I love everything you put out. So full of flavor and it looks amazing. Stunning photos! 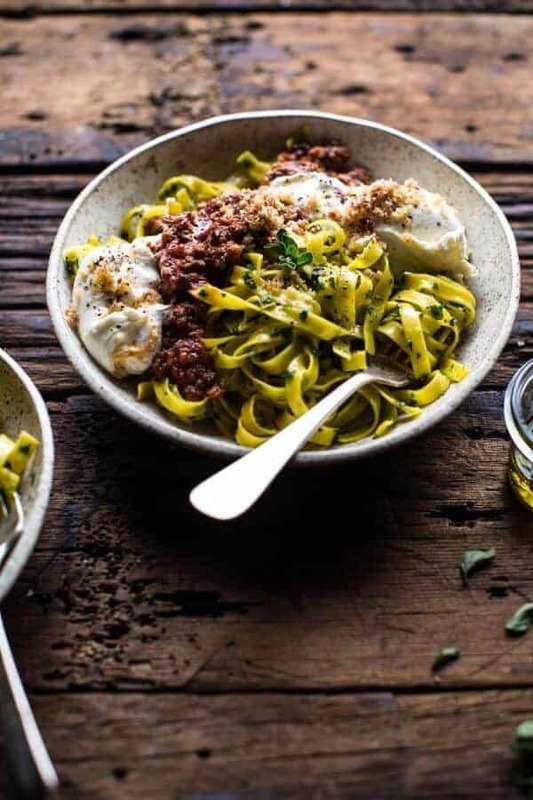 And I love everything about this recipe-burrata, chorizo, and that pesto sounds awesome. What a beautiful bowl of pasta!! Oh my word – this dish! I love pasta! 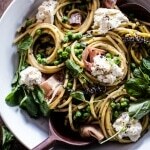 and pasta with burrata? Oh yes! Love the addition of the sourdough pangrattato, adds a nice crunch to the dish! 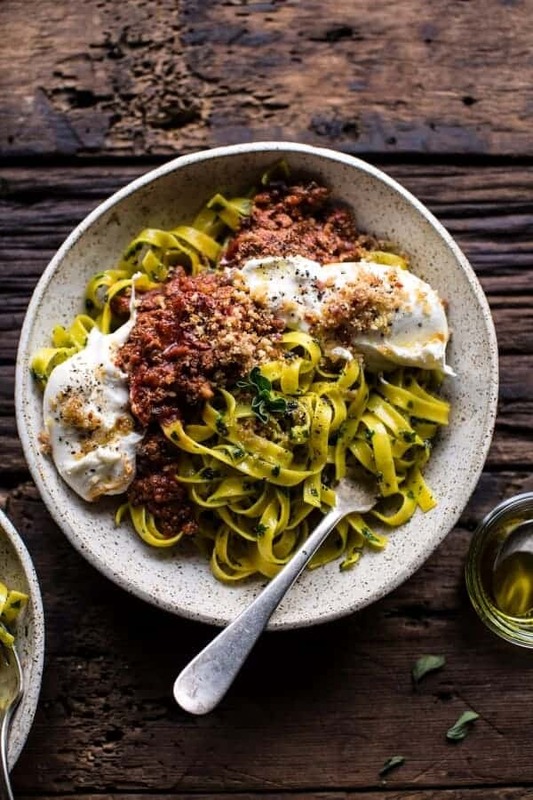 Love this twist on bolognese! This looks absolutely beautiful. It’s making me so hungry. Can you believe I’ve never tried burrata before? Seriously the best thing I’ve eaten in a while. The flavors and textures, spice and creaminess go together amazingly, thank you for sharing the recipe! 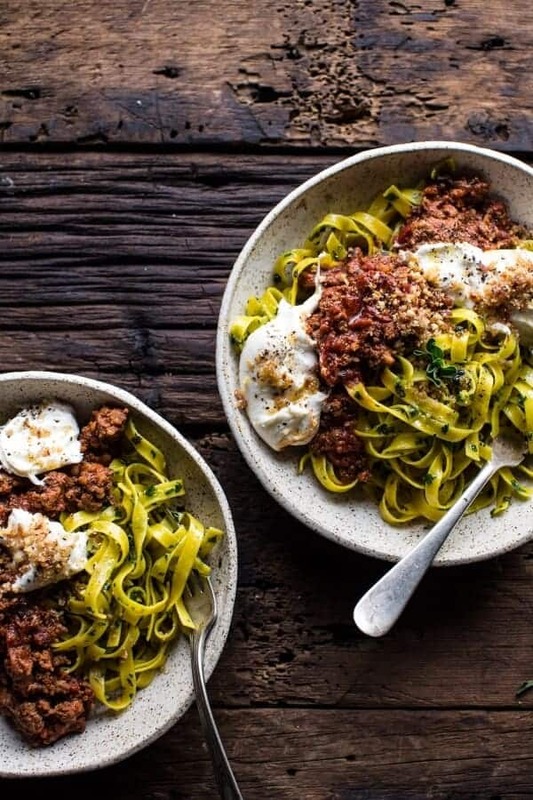 I just made this for dinner tonight, and I even just used regular ground beef and made it dairy-free with cashew milk since I’m lactose-intolerant. This recipe is so flavorful and easy to make! Better-than-restaurant quality meat sauce! Great job with this recipe, I can’t wait to try more! delicious! i’ve made this several times and have never been disappointed. however, i have a vegetarian friend and am curious what you would recommend to try as a substitute for the chorizo? Hey Sarah!! I would use lentils, I think that would be great!! Trader Joes makes a Soyrizo that should work for a vegetarian version. I’ve successfully substituted it in other recipes and will be trying it in this delicious plate of yumminess this week. Also, I think the difference in the chorizo is that dried chorizo is Spanish and the soft stuff, in the casing, is Mexican. Ah I wish the long ones didn’t intimidate you! But I totally get it. So so happy you liked this though! Such a bummer you lost the pangrattato! Hopefully you don’t this time!! I finally made this after bookmarking it almost two years ago. 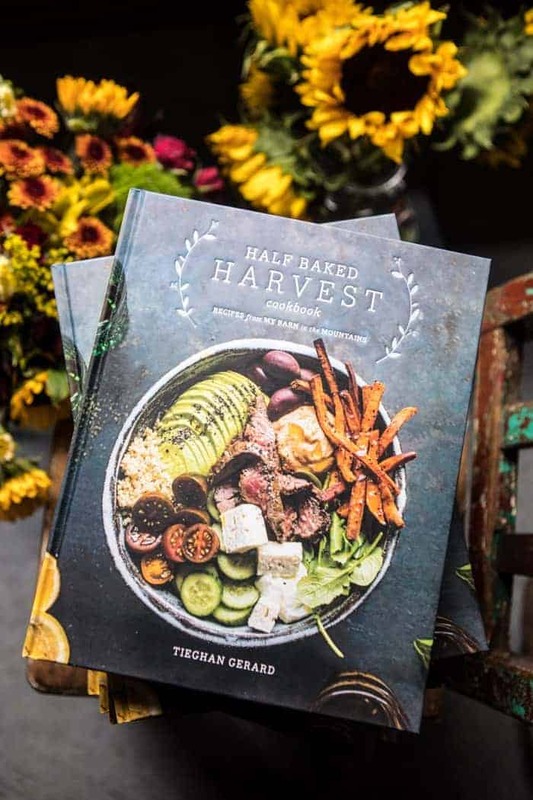 This is a classic Half Baked Harvest recipe, but don’t be scared off by the number of steps (sauce, pesto, grattatatto). It’s a very complete pasta dish like you would get in a restaurant. Because you said it could simmer away all day, I did the sauce in the crockpot and changed out the whole tomatoes with a tomato puree and a can of Italian diced tomatoes. 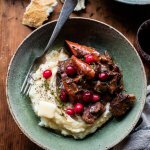 This would be a lovely dish to serve during December with friends or family. Thank you so much Rachel! I am so happy you enjoyed this!